Here's a group whose latest recording crossed my desk recently that I think you'll enjoy. Irish composer and music producer Glen Austin and RTÉ Contempo Quartet have put together a unique album to be released on November 5th that blends classical music with Irish rock and pop music from the last thirty year. New Airs features nine original string quartet arrangements of iconic songs by U2, Kodaline, The Script, Snow Patrol, Enya, Thin Lizzy, and Glen Hansard and Marketa Irglova (Once), as well as old Irish airs inspired by modern artists like Sinead O’Connor and Luke Kelly. Below is a music video the group just released featuring their arrangement of U2’s “With or Without You.” Give it a listen and see what you think. 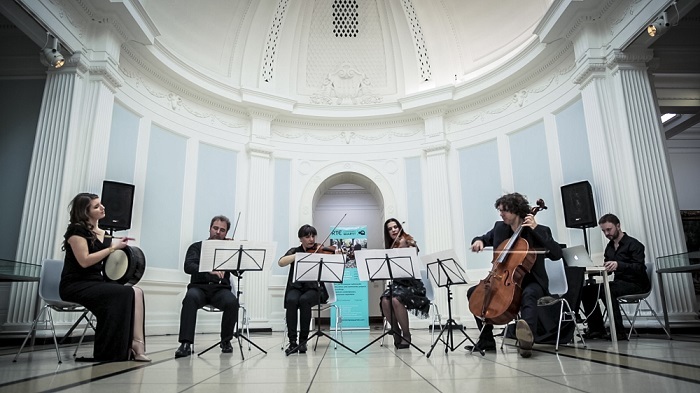 RTÉ Contempo Quartet is Bogdan Sofei (1st violin), Ingrid Nicloa (2nd violin), Andreea Banciu (viola), and Adrian Mantu (cello). Renowned Irish bodhrán player Aimee Farrell Courtney joins RTÉ Contempo Quartet for several songs on New Airs. For more information go to www.contempoquartet.com.